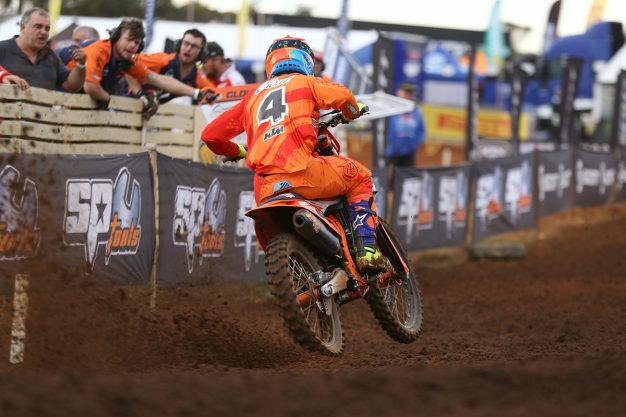 Racer comments from South Australia's fifth round of the season. 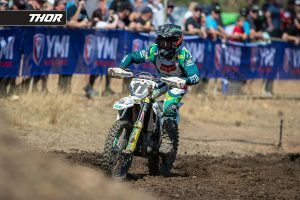 A selection of riders detail round five of the 2018 Pirelli MX Nationals at Murray Bridge, South Australia. 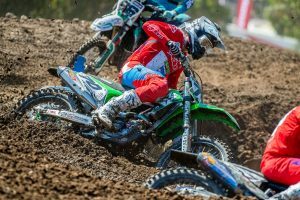 Team and privateer competitors can submit comments to [email protected] by Wednesday afternoon after events for inclusion in the post-event Quotebook feature. Moto one was a bit of a struggle as I didn’t get a chance to settle into the race and was instantly under pressure from the riders behind me. So for moto two I tried to keep a cool head, fight for places early in the race and ensure I had good track position as that is so important here at Murray Bridge. Today was typical of how my season has gone, with one good moto and one not so good moto so I need to work on my consistency and start putting two good races together. My focus during the break will be on applying myself to two races and improving my mental strength to ensure I can do that. If I can put a full day together, I’m sure a round podium isn’t out of the question. I started with Super Pole today, which was good, and in the opening race I came out of the turn in fourth or fifth, made some passes and slotted into third. I copped a lot of roost getting there and I ended up having some goggle issues, so I was forced to pull them off. I got nailed pretty hard after that and it was pretty much survival mode. Second moto we were third again, so while it was good to get back on the box with a pair of thirds, but it’s frustrating because I felt like I had great speed today and wasn’t able to capitalise on it. It was a good day for me, I got third in Super Pole and I finally pulled a hole-shot in race one and rode my own race from there. I led my share of the race from the front, but unfortunately I let that one slip away toward the end. It’s good to be leading laps though, I’ll take a lot from that and learn from the experience. The second race I put it down on the start and had to work my way back up the order, so it was an up and down day. I was fourth for the round and I’m fourth in the championship, so I can’t complain and now we will keep working hard to prepare for the coming rounds. Wanting to build from round four, I was very motivated coming into today. I really like the Murray Bridge circuit, it’s a great track and I qualified fourth, only a fraction off the lead and I was happy with my pace. Moto one, I blew the start and I rode really loose to get through, settling with the lead pack in fifth, but I got some dirt in my goggles and made a big mistake dropping a few positions and coming home in ninth. I knew I had to lay it all on the line for moto two if I was getting back up on that podium. Finally, a hole-shot in the second race, had some fresh air, got to put down my laps and charge. Around the halfway point in the moto, I really tried to up my pace and respond to Ferris putting a charge on me. I had some breathing room, the lappers were heavy and I made a couple of mistakes and the race was on to the finish. I was feeling very dialled in on my Husqvarna 450 and I rode it out to my first win for the year! What a feeling! Huge thanks to all of the DPH team and sponsors that make it possible, a big thanks to Craig Anderson for his help with my riding and all of my family for always having my back. It wasn’t a bad weekend. We definitely could have been better, but we made sure that we got some points and finished the first half of the season safe and healthy. 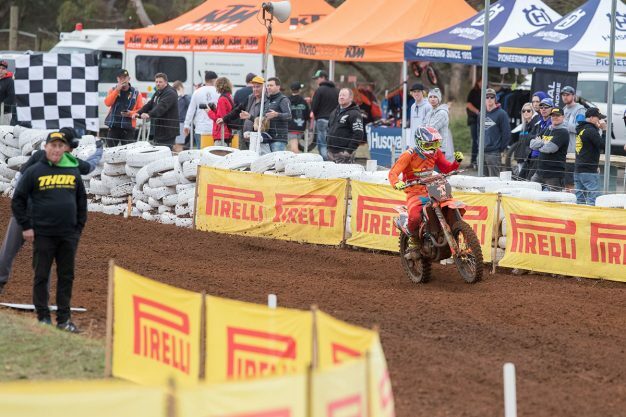 After the double podium at Wonthaggi, eighth overall is not where I want to be finishing, but we will keep working and stick to our program for the second half of the season. At the moment I’m sitting third in the championship, which is a good spot to be at the halfway point in my rookie season. We are on track in terms of the goals we have set for this year, so I’m looking forward to being even better once we get back to racing in July. The first moto was real good – I wanted to be in the top five and that’s where I was. The second moto I got an awesome start, but then I just got flustered in the following turns and tightened up. I tried getting into a groove following that. The finish wasn’t the greatest, but the first moto was really good. It’s going to be good to have a month off, I’ve been going since October, so it will be nice to relax and recharge the batteries. It was an up and down weekend. The first moto wasn’t really what I wanted, I had a poor start and ended up getting caught with some riders and went down. I got a better start in the second moto, but I had to fight my way back to fifth. I need consistent motos, I can’t be doing these races where I have one good and one bad moto, however the points are tight between second to fourth so it’s going to be a fight for the championship all the way until the end of the season. It felt awesome to get the race one win, the team and I have put in so much work, so to go out and ride like that, it’s really rewarding. It’s been a rough start to the season – and it happened last year – but I feel like I’m going to keep ticking wins off now. I’ve got the best team behind me and my KTM 250 SX-F felt great out there. Unfortunately I got caught up in the first turn during the second moto and ended up working my way back to 11th, which was disappointing, although it was still a positive round. Bittersweet day today. I feel like everything is there and my riding was great. Just once again struggled to put it together with a silly crash in each moto. We’ll keep working hard and repay the team and myself for the hard work we put in. In the past, I have never done that well here at Murray Bridge, so my focus today wasn’t about winning but riding a little within my limits, making smart decisions and limiting my mistakes as this track can really catch you out when things go wrong. A 2-3 day on paper doesn’t look great but is better than what I have done here before and to claim a round win and gain some more points in the championship is a great outcome. The Serco Yamaha team did a great job today and we are exactly where we wanted to be after round five. There is still a lot of work to do and a lot of races to come but I will use the time in the break to work on my riding and fitness as I really want to win this championship. Murray Bridge went pretty well in the sense that I didn’t aggravate any of the injuries from the first few rounds. 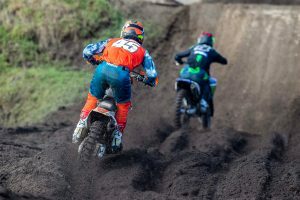 Although my moto scores were poor, I can’t expect much more than that with the amount of training I’ve been able to get in with only racing the MX Nationals. I’m looking forward to the time away during this break, which will allow me to rebuild on what I had before round one.